If you're wondering just how they can have a personal tiki hut or tiki bar in your own backyard, you've come to the right place. Did you know that tiki huts aren’t just for tropical climates? In fact, they can survive happily in colder and more temperate regions provided the frame and thatched roof are constructed properly. All this and more is explained in detail in Kevin Dunn’s book. To visit his site and purchase the book, please click here. Kevin is a professional builder who has put together a downloadable package that contains the plans, materials list, and instructions for building an 8’ x 4’ tiki bar for your home. If you were to purchase this bar from Kevin, it would cost around $5000. But using his plans and instructions, you can build your own for around $700. This is the only ebook that I know of on how to build this kind of structure at home. The 41 pages include clear photos of every stage of the building process. Even those of you with modest carpentry skills should be able to handle this project. 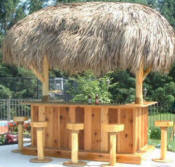 And the tiki bar design itself is no shrinking violet. Kevin builds stuff to last. It’s a real bar with under the counter cupboards, a decent amount of drink mixing space, and options for electrical if you want it. Most materials are readily available at the local building supply but there are some specialty items you should know about before you start. Cedar or cypress poles are used for the roof frame and supports. Contact a local lumber supplier for these. Palm leaves for the thatch can be ordered through an arborist or you can order them directly through Kevin’s company, www.TikiKev.com. 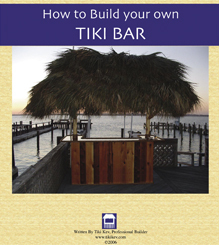 TikiKev has just published a new ebook all about building your own tiki bar stools and tables. Read more about his bar and bar stool plans here. If you are concerned about having a thatched roof in your climate, here’s some info. We are used to seeing thatch in warm, tropical areas. Will it be able to withstand the snow, frost and freezing rain that some of us experience through the winter? Won’t the thatch just disintegrate, or rot away? Kevin says no. If you build and layer your thatch correctly, palm leaves will usually last about 5-7 years. The timeframe is really dependent upon the weather in your area. Believe it or not, it’s wind, not rain or snow, that plays a major factor in the life of the roof. By installing near invisible netting over the thatch, you prevent leaves from blowing off, and thereby extend the life of the roof. One common problem is that people mistakenly cover their tiki hut or bar with a plastic tarp for the winter, believing they are protecting it from the elements. This is apparently one of the worst things you can do.